How to Bake Cookies in the Oven Range and Mini Oatmeal-Raisin Cookies Recipe – I'll Make It Myself! Food homesickness is the plague of not just expats but those who move from region to region– for example, Homesick Texan is a food blog about recreating Texan/TexMex cuisine in New York. The way the author writes about food memories and the problems recreating beloved foods when you can’t always find ingredients really resonates with me as a foodie and expat. As for home baking, if you consider the Japanese home kitchen, you’ll see why cookies are considered to have high technical difficulty here. A cake can be poured into a rice-cooker or a pan and generally cooked all at once, but cookies tend to be baked in batches. While a full-size oven can accommodate large cookie sheets, baking about 24 cookies at a time, an oven range, which is about the size of a microwave, can usually only take 6-9 at once, and that’s if they don’t expand. Always use the square metal plate instead of the rotating tray (if applicable). Either cover the plate with parchment paper or buy some metal cookie sheets to set on top of it. Choose recipes where you know the cookie won’t expand a lot. Recipes without or with little baking soda or baking powder (about 1 tsp), drop cookies that retain a small shape, and cut-out cookies tend to do well. Make a small batch. 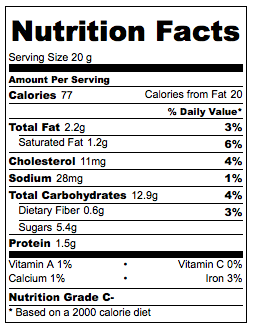 A lot of American recipes may yield 24-48 cookies on average. Choose recipes you can easily halve or that you can store part of the dough in the freezer until a later date. I can usually make a recipe that yields 24 small cookies in about 3 batches. Consider the cookie-cake. If you must have Tollhouse-style cookies that expand a lot, buy a couple shallow tart pans and spread the dough into them to create cookie-cakes. Now, on to the recipe! I love oatmeal-raisin cookies. Oatmeal and raisins rarely make the holiday cookie roster back home, but there’s a lot of charm in their simplicity. They are thoroughly unpretentious but entirely classic. 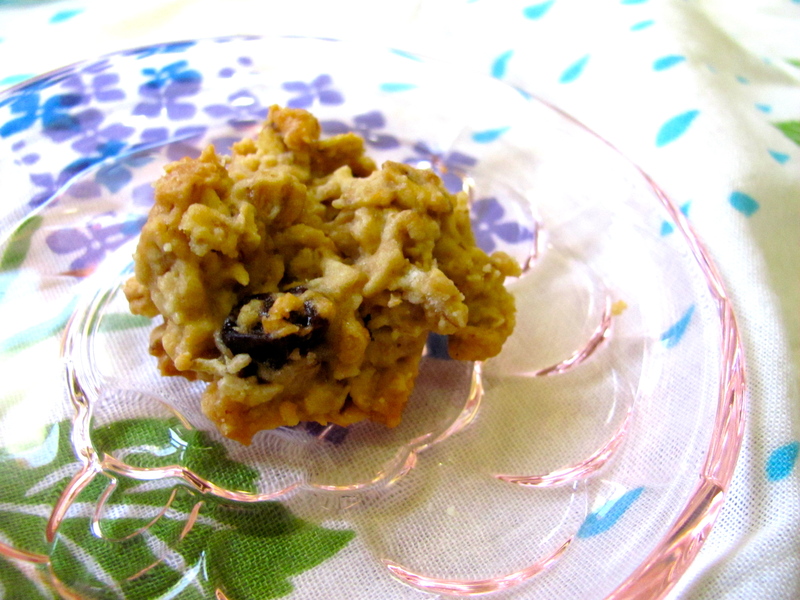 About the ingredients: I used jumbo rolled oats, but any size oats should work. 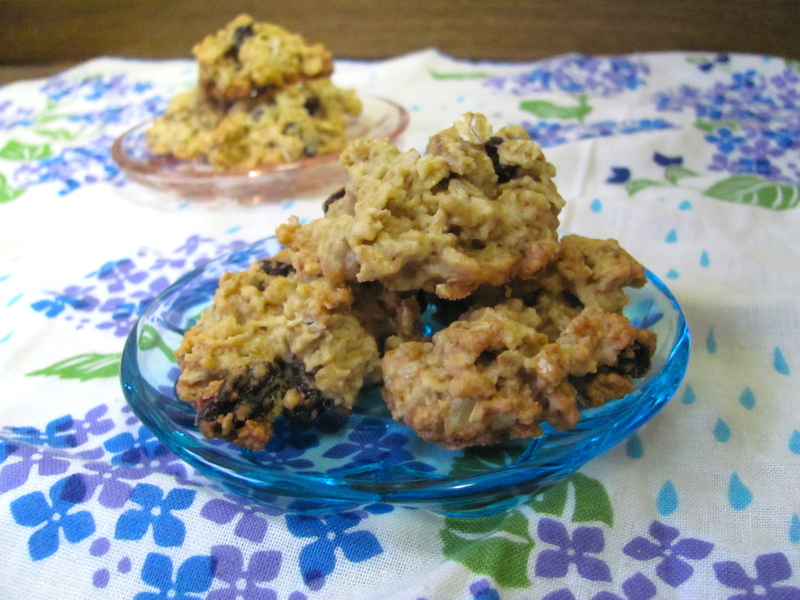 Smaller oats will make your cookies less textured than the version pictured. These cookies contain no leavening agents, so they will stay in more or less the same shape; if you want more rounded and flatter cookies, take a little time to shape them with your spoon instead of putting them on the cookie sheet drop-cookie style. As for the size, I like these bite-size, but if you prefer larger cookies, double the size of the cookies or make a cookie cake. 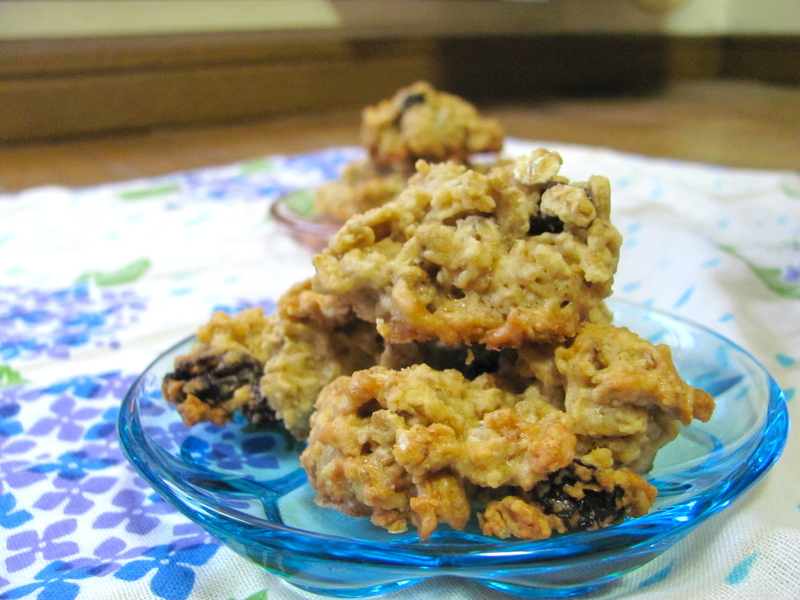 Adapted from “Oatmeal Raisin Cookies” from Cooking Light. 2. Mix softened butter, sugar, egg, vanilla, and salt well. 3. Slowly mix in flour and oats. Add raisins. 4. Drop by rounded tablespoonful about 3-5 cm (1-2 inches) apart onto parchment paper or greased cookie sheet; reshape as needed. 6. Cool completely on a wire rack or plate before storing in an airtight container. *I used natural brown beet sugar (tensaitô, てんさい糖, 甜菜糖), but you could use brown sugar (sanontô, 三温糖). I’ve been itching to make cookies but have been afraid they wouldn’t turn out in my microwave-oven-toaster thing. I just need to give it a go and get over my fear. Maybe I can start out with these since the recipe definitely works! Go for it! Someday I’ll post a photo of the first time I tried to make cookies. What a disaster… Enjoy! So, funny story. I know your “friend from language school” quite well. Yesterday I was telling some newly arrived people, who were complaining about foods they couldn’t make in Japan, about your blog, and he piped up, “I know her! She promised me an oatmeal raisin cookie recipe!” Then I got home last night and saw what else but this post. Cookies for everyone! Hooray! Japan Studies is such a small world! At least now your newbies know I deliver on favors for friends. ;) Thanks for promoting me, and I hope everyone enjoys the cookie recipe! I love the cookies. I’ll definitely make these because it’s so easy to make and it sure is delicious to eat.